A temporary, five-station GPS network was installed in Yellowstone National Park in response to increased heat and steam emissions in parts of Norris Geyser Basin. 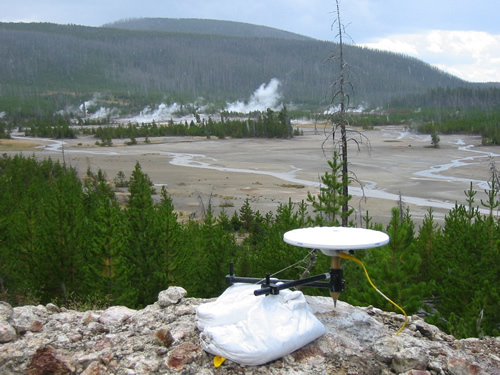 The network was installed by a UNAVCO engineer, University of Utah students and faculty, and National Park Service scientists as part of a monitoring effort by Yellowstone Volcano Observatory (YVO). YVO is a collaborative partnership between the U.S. Geological Survey, the University of Utah, and Yellowstone National Park. Changes that lead to the special deployment within Norris Geyser Basin included the formation of new mud pots, changes in geyser activity, and significantly increased ground temperatures of up to 200 degrees Fahrenheit. The GPS network is complemented by a 7-station array of seismic broadband seismographs provided by the Integrated Research Institutes in Seismology (IRIS). GPS and seismic instruments were co-located where possible. The current activity in Norris Geyser Basin provides an excellent opportunity to quantitatively document and better understand hydrothermal disturbances and possible seismic sources associated with active volcanic systems. Given the strict environmental considerations for operating within the national park, minimal monumentation included 6-inch stainless steel pins epoxied in a drill hole flush with the ground surface at each site. The GPS receivers were Trimble 5700 instruments with a Zephyr antenna, powered by one 100 amp-hour battery charged by camouflaged, 35-Watt solar panels. Where possible, a spike mount set-up was used for mounting and stabilizing the GPS antenna. The result is a very low-profile installation, an important consideration in a national park.